What is Branch Railing and Twig Railing? Branch railing and twig railing is a type of railing that is made with the twigs and branches of trees. Mountain laurel is a common tree to use for branch railing due to its strength, durability and intricate natural shapes. Guardrails are required along balconies, decks or stairs usually where there is a height difference of more than 30″. 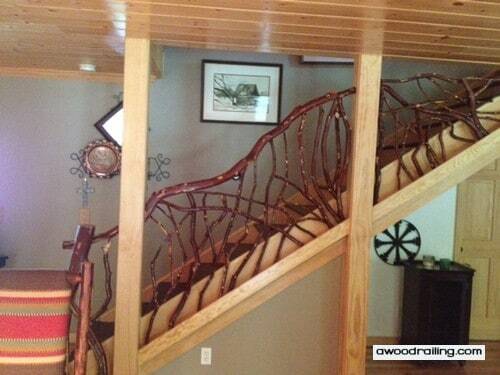 A tree branch railing can be functional and also an amazing addition to any space! 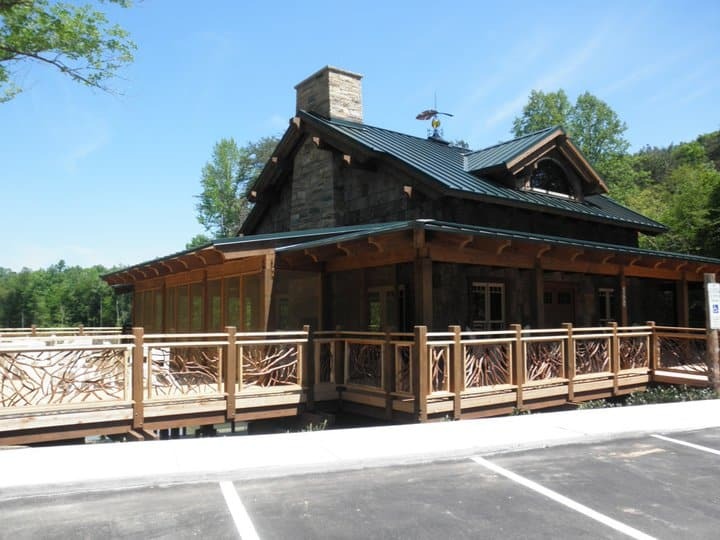 The twig balusters used in Mountain Laurel Handrails are usually no less than 0.5″ diameter and no more than 1.5″ diameter. 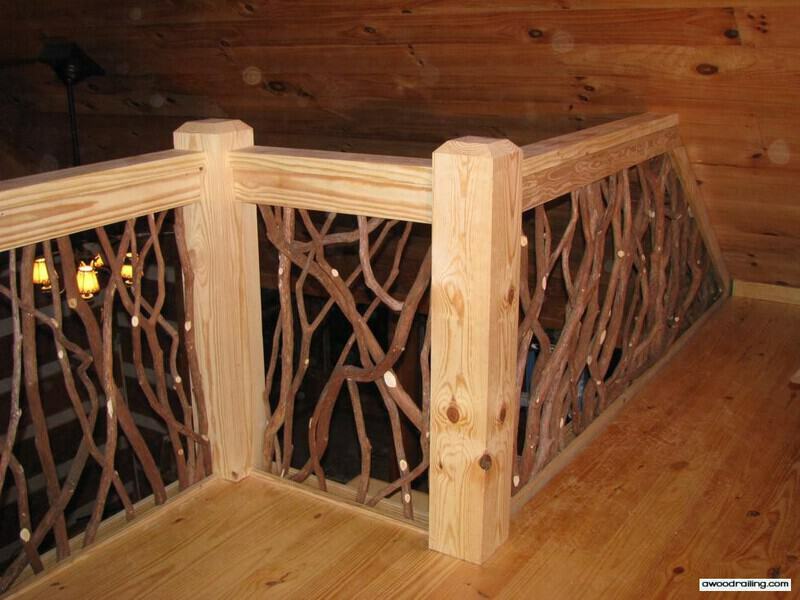 The mountain laurel tree branches are preferred for decorative branch railing since they are strong enough to hold fasteners and withstand a large amount of pressure before breaking. Twig balusters are also strong since they are often fastened together at different points in the weave. This makes a twig handrail sort of like a sheet of OSB (oriented strand board). This kind of board is similar to plywood but is instead just chips of wood laid down in a certain manner and glued together with a very strong glue. The picture below shows a Mountain Laurel Handrail that is ready for shipment. These sections are available for delivery nationwide. Proudly Made in America, the twig railing sections are built to your actual post-to-post measurements. The top and bottom 2×4 boards are about one inch longer than actual measurements. When the branch handrails arrive on site, mark the 2×4 boards, cut them to fit and install with screws. Your contractor provides additional lumber and posts. Please visit the Frequently Asked Questions for all the details. Using twigs in a log railing is a natural match. The round shape of the logs is perfectly complemented by the organic and sinuous shapes of the twig balusters. For the tree branch handrail shown below, the top and bottom logs are black locust, and the twig balusters are mountain laurel. The branches for the log and branch railings are usually a larger diameter to match the stockier, burlier feel of the twig and log railing. These decorative wood branches make perfect balusters at 1.5″ diameter to 2.5″+ diameter. The top black locust log is 3″ to 4″ diameter, and the bottom one is 5″ to 6″ diameter. The logs can also be of different lumber. In the picture shown below, the top banister is a mountain laurel log that is between 3″ and 4″ diameter. The bottom board is a yellow pine 1×4 to match and blend into the stairs. The resulting look seems to grow from the bottom of the stair stringer into a natural shaped tree branch banister and beautiful tree branch stair railing. The best way to get started on a new construction or remodeling project is with a professionally prepared set of plans, drawings and specifications. Architects and designers use CAD programs like Revit, AutoCAD, ChiefArchitect or 20/20 to prepare the plans. These computer-aided drafting programs can also show photo-realistic renderings of the designs and what the finished home construction project will look like. Architects and designers can use these drawings to easily incorporate Mountain Laurel Handrail into the wood deck plans. Rendering Mountain Laurel Handrails in 3D modeling software can be difficult due to the complexity of the shapes in this rustic branch and twig railings. The picture below can be used in 2D elevations and sections of the architectural drawings to help get a feel for how the handrails will look.